This viticella from Stefan Franczak has small to medium violet Blue flowers with a darker bar and creamy greenish Anthers with white filaments Good for a beginner who loves shades of blue. 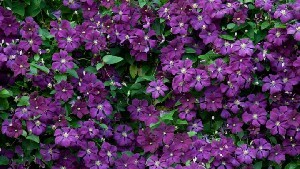 Emilia will produces masses of flowers and is very easy to grow. Named for A Polish Heroine of the November Insurrection of 1830. 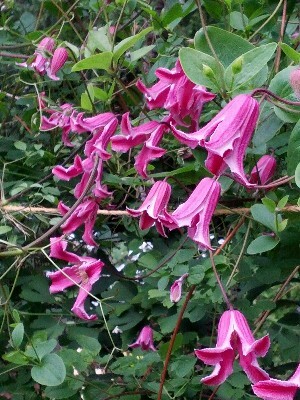 Etoile Rose dates back to the early 1900's and was one of the first clematis I bought in my early days of clematis seeking. It looks lovely mixed with Etoile Violette or all on her own. 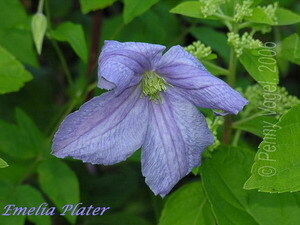 I am very fond of all the bell type flowering clematis since they are well appreciated by the bees and hummingbirds.